You may only think of a lint roller when you’ve got a spec of something on your suit or dress, but today’s lint rollers claim to do so much more. They can of course get rid of lint, but they’re also making the claim that they can tackle pet hair, and some even say they can be used to pick up bigger items from the floor, furniture, and even carpeted stairs. When you are presented with the different options, you might wonder if it’s worth spending a lot of time on this choice. It is, after all, just a lint roller. But with some of these it could mean the difference between buying a lot of disposable lint rollers again and again, or just buying one reusable lint roller that you can just wash, dry, and keep going with. 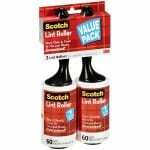 Also, there are some that are more effective than others, so you have to consider that the right choice here can save you a lot of time, money, and hassle, and the wrong choice can lead you right back to the lint roller shopping experience. To try and make things faster and easier for you, we’ve gone through what’s currently making waves in the lint roller market, and ran it through or proprietary review process. What follows are the recaps of our full reviews so that you can get a quick idea of what catches your eye, and then delve into the full review once you’ve made your shortlist. 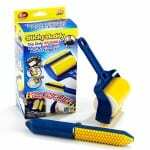 The Sticky Buddy is the real McCoy. It’s one of those newfound marvels that doesn’t need a refill pack because you just wash it off and reuse it again and again. The sticky level is pretty high with this, so you don’t have to go over things a bunch of times before they get picked up. It comes in multiple sizes so that you can use it for different jobs, even things you never thought you’d use a lint roller for. This means that it can save you time because you won’t have to lug out the vacuum or a sweeper to pick up small messes. 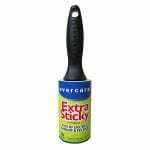 The Evercare lint roller brags that it’s extra sticky, which really comes in handy when you can pick up stubborn lint in one pass. Some of the cheap or generic lint rollers out there make you go over the same spot again and again and sometimes you even have to just grab the lint with a pinch and pull it off by hand. But not with the Evercare brand. 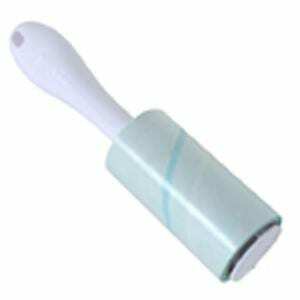 This is pretty much your traditional lint roller, just with an extra sticky surface so it’s more effective and gets the job done more efficiently. 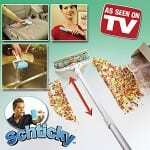 This is the lint roller peddled by Vince Offer fresh out of jail from his whole “incident”. He even references his jail time in the infomercial. He shoes the Schticky doing all sorts of odd jobs around the home, and demonstrates that it’s really easy to rinse off, dry off, and start using again. However, real users have said that it doesn’t wash off as easily as it is shown, it doesn’t dry very quickly, and when it does, it doesn’t stick as good as it did the first time. Overall, this product is a disappointment and we recommend going with Sticky Buddy instead. Mr. Sticky is trying to compete with the Sticky Buddy and the Schticky, but it falls short. This is basically an arms race to see who can use the best sticky substance with the most technology added to it so that it can withstand being washed and reused again and again without losing its sticky nature. This just has the overall feeling of being a generic knockoff of the originators. Users felt the same way and have complained about how it’s not easy to wash or dry, and that when you go to reuse it, it just doesn’t stick very well. These are basically your old school lint rollers, and they require you to peel off the old piece of sticky tape when it gets full, so you can reveal the new and fresh one waiting to go. While these are pretty outdated as far as technology goes, they are the classic standby, and still work well enough to keep around the home or office. The biggest drawback is they’re disposable, so you have to keep buying them when they get used up. And also, they’re sticky enough to get the job done, but not super sticky like some of the competition that’s out there. 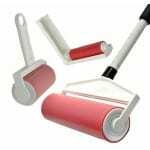 There are a lot of people that complain about the reusable rollers, but there are certain things you can do to take care of them and make sure that they maintain their stickiness for the long term. The first is that you don’t have to wait until it is inundated with lint, hair, or other debris. You can wash it off when it just has a few things, or after each use. Next, you don’t want to use hot water, or cold water, so make it luke warm. You also don’t want to use any cleaning solvents, as this can wear out the stickiness. Once you’ve got all the debris from it, you can either let it air dry, or if you need to use it right away, make sure you use a chamois cloth instead of a terry cloth towel or dish rag. This will ensure that the roller doesn’t pick up a bunch of fuzz and pills from the towel. A microfiber cloth is perfect for the job. Once it’s fully dry, it should start sticking to things again, and you’re ready to go onto the next job, or finish the one you were working on before it filled up. You’ve probably noticed by now that dog and cat hair like to stick to just about anything. If you’ve been trying to vacuum it up, forget it. And if you’ve been using a disposable lint roller, you’ve probably gone through sheet after sheet of seemingly impervious lint hair wondering if you’ll ever get all of it up. It seems like just when you think you’ve got it all, there’s more waiting for you on another sofa cushion, or on another section of carpeting, or your clothes, or in your mouth. Everywhere! The best lint roller for pet hair is one of the reusable ones. Sure, you’ll have to wash it a lot if you have a lot of pet hair, but once you dry it off it will be ready to pick up more pet hair, and since you don’t have to worry about the cost of a disposable sheet of sticky tape, you can go nuts with it and wage war on all the pet hair in your life. The standard use of a lint roller is pretty easy to master. If you’ve got a piece of lint on your suit or dress you simply roll the roller over it until it’s gone. However, with some of the new lint rollers that have come out, you can use it for all sorts of odd jobs that you never would have thought of before. One example that is shown is picking up food particles in your pantry and cupboards. This would be great to prevent ants, roaches, and other insects from infesting your home. Another use is cleaning carpeted steps so you don’t have to lug the vacuum up them or use one of its attachments. They also show that it would be great to pick up crumbs out of the car, instead of having to use one of those bulky and hard to use auto vacs at the car wash. You can also use some of the bigger rollers for things like dust bunnies in places that are hard to get to. If you go online you can get instructions on how to come up with your own makeshift lint roller. Heck, in a pinch you can just wrap some invisible tape around your fingers and that works at getting lint off of your suit. This little trick can save you from an embarrassing situation if you’re on the go and there isn’t a lint roller to be found. Some people wonder what’s better, a lint brush or a lint roller. A lint brush is most good just for lint, and just on things like a wool suit. It’s not going to be very good for hair and other debris, other than brushing it off, the same way that your hand would work. In our opinion, it’s hands down the lint roller, because it can do everything a lint brush can do, plus a bunch more. There are a few different lint rollers out there that claim that you can use them over and over again and that they won’t lose their stickiness. This is a pretty remarkable product indeed, and something you’d likely see coming from the labs of Professor Brainerd. The major draw here is that they say this would make it the last lint roller you ever need to buy. Obviously, this is an attractive premise, since you could use it as much as you want without having to worry about buying refill packs. However, some people have complained that the wash and reuse claim of some brands is bunk, and that once you wash it and reuse it a few times it loses the stickiness. Others say that when you try to dry it off it pulls the fuzzies from the towel and needs to be washed again. That’s why it’s important to check out our reviews so that you can steer clear of the problems and get the right roller with the best ratings. You pretty much have to go reusable in this day and age because we have the technology so you might as well use it. The nice thing is that many of the reusable rollers out there come in packs of different sizes, so you get a travel sized one to take with you or put in the car, an ordinary sized one to keep handy around the home, and a large lint roller that you can use to pick up dry spills around the house.